As hockey fans, we shouldn’t be cool with what Ray Emery did to Braden Holtby on Friday night, and in seeing the backlash to that assault, we aren’t. As a pro-fighting guy, I’m not cool with what Ray Emery did, because as much as some writers on this site belittle “The Code”, at the very least it mandates that fights should be between two willing participants and, typically, with understandable cause. “RAY EMERY MAD, RAY EMERY SMASH” doesn't rise to that validation, obviously, which is why what happened to Holtby is something only the bastion of the rink has prevented Emery from facing criminal charges. Holtby's not the first player to get jumped and be an unwilling participant in a fight. But Holtby didn't deliver a questionable hit. This wasn't about retribution. This was about Ray Emery attacking a guy because he figured that's what the locals wanted to see and because he's terrible without the Blackhawks' security blanket. The most twisted aspect of this – besides the Flyers joining the Sabres as the only teams in the League that believe their draft lottery odds increase with punches landed, apparently – is that the NHL was powerless to prevent it or retroactively punish Emery for it. Let’s start on the ice with the joke that was Francois St. Laurent. He’s still fairly new to the NHL as an official, although he’s had moments of infamy. Remember when AHL goon Patrick Kaleta took a run at Mike Richards and then Richards was given a 5-minute elbowing major for defending himself? That was St. Laurent. On Friday night, he had a chance to stop the Emery fight or at the very least allow a Washington Capitals player to stop it for him. But he didn’t. Michael Latta of the Capitals raced over to do Francois St. Laurent’s job, but the referee waived him off, allowing Emery to pummel the head of an opposing goaltender unabated. Like any player, he would have taken the ‘third man in’ ejection to save his guy. He was told to hang back. St. Laurent probably felt he was controlling the game, preventing further carnage. Yes, at the expense of a goalie being carved up by an amateur boxer. It was sickening. But as the League said, there’s nothing currently in the rulebook under fighting that would allow for supplemental discipline. 6.17 Fines and Suspensions - Aggressor - A player who is deemed to be the aggressor for the third time in one Regular season shall be suspended for the next two regular season games of his team. Prior to the commencement of each Stanley Cup Final, a player or goalkeeper will have his current aggressor violations removed from his current playoff record. They will remain part of his historical record. So like Rule 48 after Cooke/Savard, Ray Emery’s psychotic episode will allow the NHL GMs to quickly amend this rule to an automatic suspension for any aggressor when they meet next week. It’s an quick loophole to close, and a very easy sell to the conservatives in the group, given recent events – drop John Scott’s Phil Kessel chase in there too, for good measure. 28.1 Supplementary Discipline - In addition to the automatic fines and suspensions imposed under these rules, the Commissioner may, at his discretion, investigate any incident that occurs in connection with any Pre-season, Exhibition, League or Playoff game and may assess additional fines and/or suspensions for any offense committed during the course of a game or any aftermath thereof by a player, goalkeeper, Trainer, Manager, Coach or non-playing Club personnel or Club executive, whether or not such offense has been penalized by the Referee. Are we going to argue semantics here on "additional"? Hope not. Bettman has broad powers as commissioner. As Sean Avery can attest, the League can do whatever it damn well pleases if it doesn’t like your behavior. The idea that the NHL was powerless to suspend or fine Ray Emery for this onslaught is a fiction of their own creation. It is, in the end, their choice not to have done so. If you want to argue the current rules aren’t enough to warrant the commissioner, then consider who was being assaulted – a division rival’s starting goaltender. You’d think that a goalie being pummeled in the head would earn Emery the electric chair, given how the NHL vigilantly protects both. But not here. 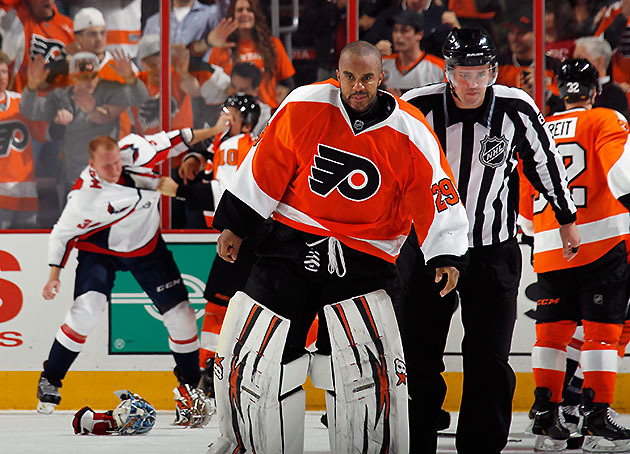 Had it been with a stick instead of his fists, Ray Emery would have gotten 25 games from the NHL. Maybe the fighting debate has the NHL in such a moral quandary that it can’t recognize the difference between a fight and an assault. Because this was an assault, an embarrassment to the NHL and the fact that everyone from the referee on the ice to the commissioner in Manhattan feigns weakness to prohibit it compounds that embarrassment.